FOUND: The syrups of the Sonoma Syrup Co. Soon both and Coke and Pepsi released a line of flavored drinks, which continues today. But there is nothing like a freshly made “vanilla (Diet) Coke” made with a nice vanilla syrup. Now combining my love of vanilla syrup with my ever increasing fascination with the products of the Sonoma region of California – and you can imagine how thrilled I was to discover the Sonoma Syrup Co.
Sonoma Syrup Co. has many great products available and their website includes recipes and uses for the various syrups and extracts they sell. Pass the Diet Coke please! We love candles. How else can you explain the fact that for the nth year in a row Sophie and I were up early on the day after this past Christmas to visit the Yankee Candle semi-annual sale? In the crowded market of candles and other home fragrance products these days, it takes something really special to stand out. The candles from Seda France definitely fit the bill. I received one as a holiday gift and was quite impressed by the product as well as the packaging. I will admit that I had never heard of Seda before, but I asked around and did some research and it seems that I have been in a bubble. I particularly like the French Tulip candle – but check out the Seda France website – there are some great bargains to be had in the sale section. I promise to get off my Napa Valley kick soon – but I am finding so many cool products coming out of the general area and none of them are wine. 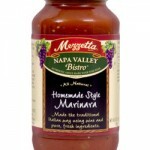 My latest finds are the pasta sauces of Mezzetta of Napa Valley California. Mezzetta “use only Napa Valley wines from neighboring wineries.” They take advantage of their location in Napa Valley for cooking wine into their sauces along with fresh ingredient grown locally. Pasta sauces may be a dime a dozen these days, but you can really taste the difference when it is made with great ingredients by people who know what they are doing. See the Mezzetta pasta sauces here. See more about Mezzetta here. This past November, while I was foraging for a cranberry chutney recipe to surprise my Thanksgiving dinner companions, I came across dozens of other chutneys. 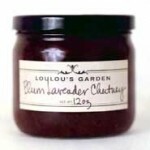 But one stuck out above all the others, a Plum Lavender Chutney from Loulou’s Garden. Loulou says that this chutney “is delicious on lamb or pork, a divine accompaniment to a goat cheese and will even hold up to a Stilton.” I think it would be perfect with a day-after turkey sandwich to kick it up a notch from the beloved cranberry. Loulou’s Garden makes the Plum Lavender Chutney with “fresh ginger, mustard seeds, red wine vinegar, raw sugar, lemon zest and lavender from our garden.” Sounds great. Loulou’s Garden makes stuff that sounds great and is in Northern California. Sounds about right. Check out Loulou’s Garden here. I have talked about my obsession with watches in the past. One of my favorite brands of watches is Fossil. Fossil makes great looking and dependable watches at a very affordable price. I have literally dozens of Fossil watches which I have purchased over the years mostly at their outlet stores at bargain prices or were given to me as gifts. But this post is not about Fossil’s watches, but about the very cool aesthetic they have been carving out for themselves as part of their brand – a whole vintage vibe. The new products Fossil has been producing have a timeless (pun intended) feel and they have brought this feeling to another level by presenting a series of “Fossil Finds” – a collection of unique one-of-a-kind vintage items that fit a whole feeling they are trying to convey. 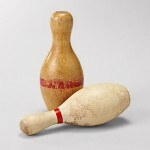 For someone like me, who loves vintage find, the Fossil Finds are awesome – ranging from radios to cameras to typewriters and even mini bowling pins. Check out the Fossil Finds here – but if you see something you like, buy it fast, these things go quickly. With winter well underway I have been making tea more and more. Over the holidays I received many kudos for a peppermint tea I served and I am always looking for nice tea blends for myself and guests. 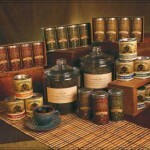 I was recently turned on to First Colony Coffee and Tea, a purveyor of fine teas and coffees. I love tea, and most often purchase it in bags at the grocery store. But I really do like the whole loose tea thing – it is just so much more authentic. I was very pleased to see that First Colony sold a nice variety of loose teas in addition to bags. I just put an order in for a one pound bag of French Vanilla tea. I have written about my (limited) success with container gardens over the years and have every intention on trying again this year. I am always looking for new ways to use my space and for containers that make sense for my garden. 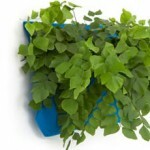 I was thrilled to come across Woolypockets, a super cool “system” for growing gardens. I love the idea of these things – you can really transfer a space and grow things in ways you never could before. The deck space I have currently have for me container garden is limited. Were I to add some vertical space with this type of planting system, I could tray many more types of plants. I did experiment with the “as seen on TV” upside-down tomato planters and really did not like it. Woolypockets seems to be similar but there are so many more options I look forward to checking them out. Of course I will provide a complete report of my progress. Right before Christmas I was returning from a business trip to Washington , DC when my luggage was lost. This was the first time in all my years of travel that my luggage didn’t show up on the baggage claim carousel. There were many times over the years that I was surprised that my luggage didn’t get lost – when I had multiple connections or made last minute flight changes, etc. But this was a simple shuttle flight from BWI to BOS on a airline that ONLY flies to Boston from BWI. Anyway, the bag was found and delivered to my home the next day – completely intact. But this got me to thinking about the state of my luggage. When asked to describe my bag to the lost luggage folks, I really couldn’t. “Well,” I said. “It is a mid-sized black roller bag.” Of course that describes 90% of the luggage these days. I then had to describe some items inside the bag that might help identify it should the tags have been stripped off. I was thinking that I really need to get a more distinguished bag so it is easy to spot when coming out on the claim belt, and in case I need to be able to describe it in an emergency. Which is why the travel products from Halsea are quite appealing to me. Halsea makes a line of distinctive travel products which I am sure I will have no problem describing or finding. 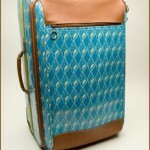 Check out the “salt water blue” print roller bag from Halsea’s China Cove Travel Collection I have been eying. 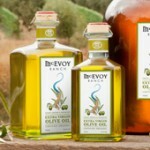 My obsession with fine olive oils and California’s Marin County area continues. At this point Petaluma, CA seems like the coolest place on earth. There is a red pin on the place on my map of places I must visit. Anyway, I saw the products of McEvoy Ranch and knew right away that I needed to try them. A tour of McEvoy Ranch is now on my fantasy vacation itinerary of my trip to California . Now just to find the time. The Russell Johnson with whom I am most familiar is the American character actor best known for playing The Professor on the iconic sitcom “Gilligan’s Island .” I was always amazed by what that guy could do with a coconut shell or two. Well, I was delighted to discover another Russell Johnson, he of Russell Johnson Imports. Russell Johnson Imports was started by, surprise, a guy named Russell Johnson who was inspired by a visit to Buenos Aires – just like I have been. Mr. Johnson fell in love the San Telmo street market, the same way I did but was inspired to create an import business around the great items he found there. Mr. Johnson is an inspiration for a number of reasons. First and foremost to experience something and want to share it with others is cool, but also to be able to have a vision – and the fortitude – to build a business around it is just great. In addition, the products Mr. Johnson finds and restores are great. 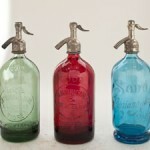 Who doesn’t love the seltzer bottles (a trademark of the San Telmo market), but the telephones are awesome. Check out Russell Johnson Imports and I am sure you will be inspired too.